We try to get the heck out of dodge come the weekend, even if it's just for a short jaunt outside of Portland. Sticking close to home for the weekend, we decided a day-trip was in order and headed out to the Sandy River to sling for Steelhead. 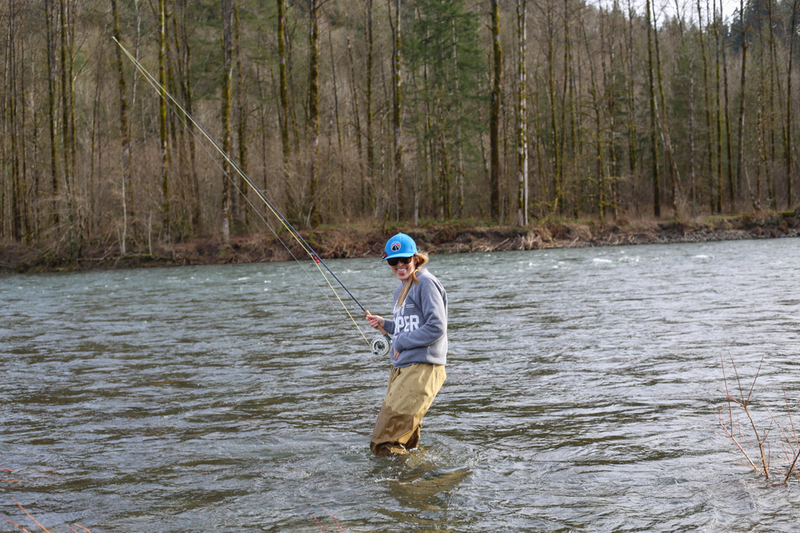 While there wasn't a single fishy nibble, we still caught some spring fever with a little casting, slinging, singing and soaking up of that rare February sunshine. Pick your trail and find your way. There's no wrong direction if the purpose is to explore! Dipping our toes into the strong Sandy river currents! Laura is seasoned at fording rivers from spending her summers working in the Frank Church-River of No Return Wilderness in Idaho, counting fish populations. Tangled up in blue. Rebecca was a flying fish in another life, so it only makes sense that she now loves to fly fish. That calm steely stare. Kd explores at the pace of a river and is an equal force to be reckoned with. Layin' it all out on the line. That moment when it all comes together for the perfect cast. We like to stand and stare at water a lot. There's a magic in knowing something so vast is the cradle for so much life. We exist because these rivers exist. Hidden and mysterious life is suspended in those waters which are the major thoroughfares for our treasured Steelhead. We are grateful, and a cold beer sure does make it all more enjoyable!